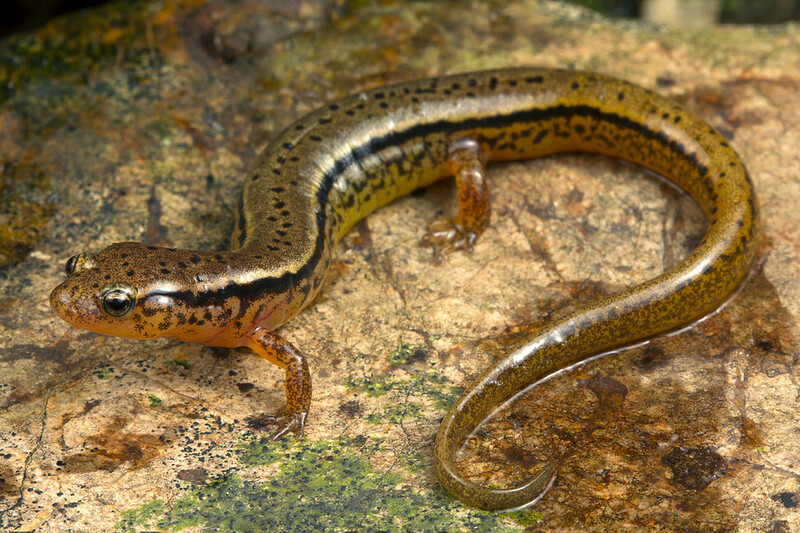 Description: The Blue Ridge two-lined salamander and the southern two-lined salamander (Eurycea cirrigera) were formerly considered different subspecies of a single species. Both species have an underlying yellow to orangish color and dark brown or black stripes which run down the sides of the body. Both species usually have a number of scattered black spots or blotches on the back. The color of the Blue Ridge two-lined salamander is generally more vivid than that of the southern two-lined salamander. 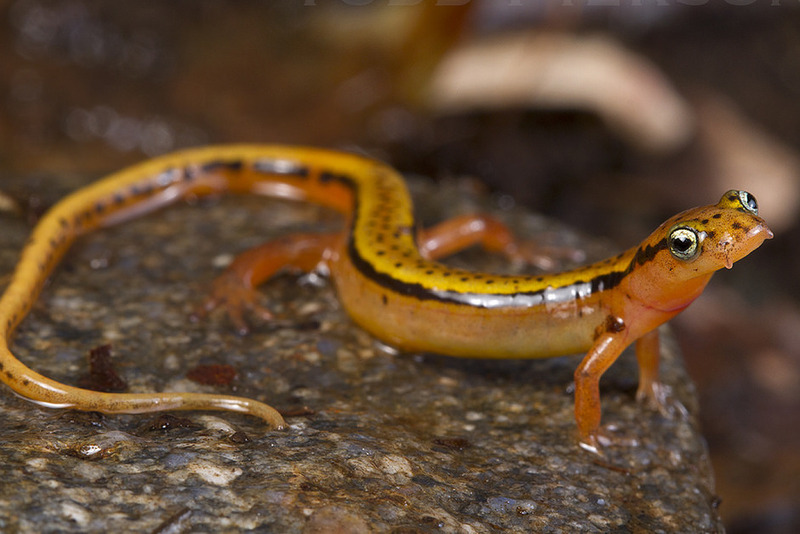 The lower border of the stripes on the Blue Ridge two-lined salamander are relatively straight-edged while the lower border of the stripes on the southern two-lined salamander tend to fade into the yellow or orange of the belly. Also, the stripes on the sides of the southern two-lined salamander typically run all the way down the tail while the stripes on the Blue Ridge two-lined salamander break up about halfway down the tail. Larvae are dusky yellow in color and have six to nine pairs of light spots on the back. Blue Ridge two-lined salamander larvae also have squared snouts and reddish gills while Desmognathus larvae have rounded snouts and pale or silver gills. Habitat/Range: Blue Ridge two-lined salamanders are found in and around streams of any size throughout the Blue Ridge Mountains. 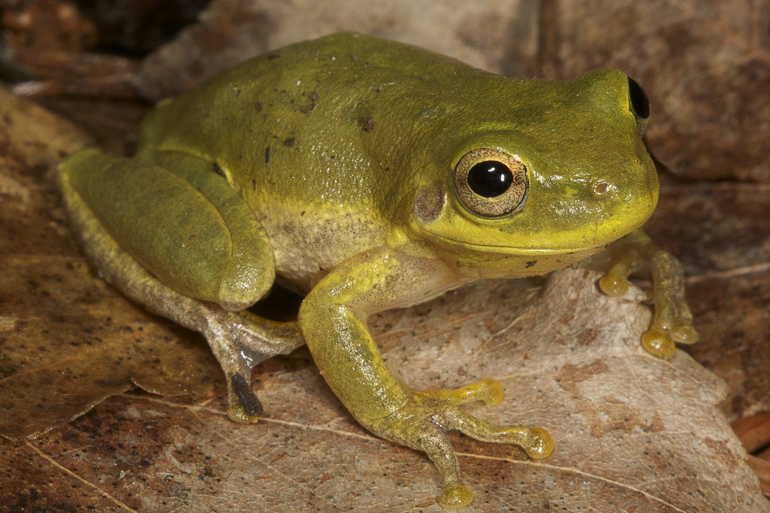 Adults may be found in streams primarily during the breeding season. 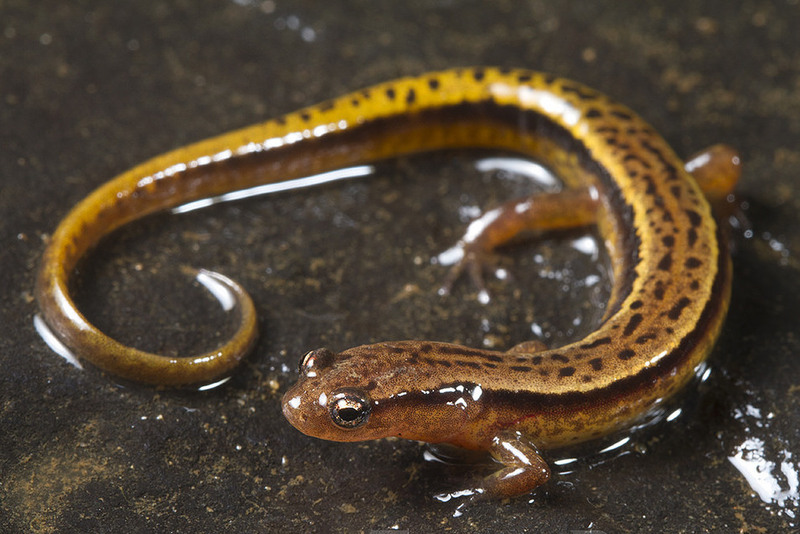 At other times, these salamanders range far into terrestrial habitat and are less common around streams. Larvae are commonly found under rocks or leaves in streams throughout the year. Diet: Blue Ridge two-lined salamanders primarily consume a variety of small invertebrates. Reproduction: The breeding season begins in late winter or early spring. At this time, females deposit their eggs under rocks, logs, or leaves in water. Females typically guard their eggs until they hatch. 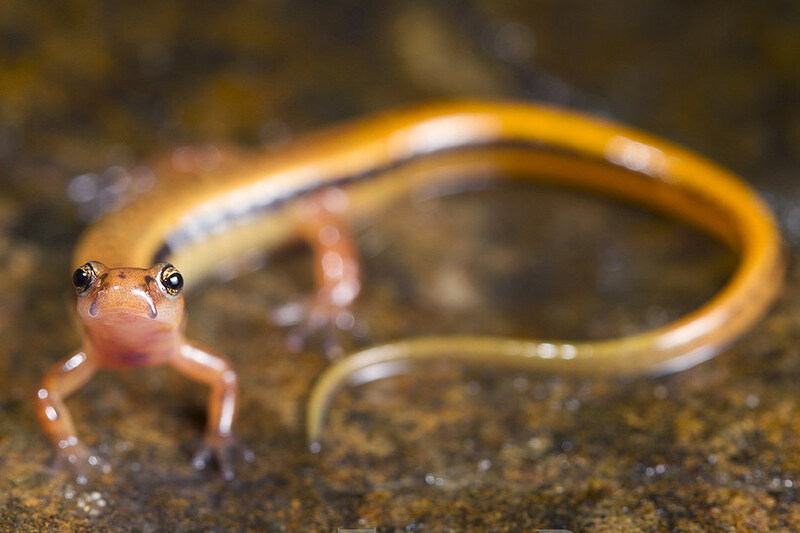 Hatchling salamanders emerge from their eggs with external gills and spend around 2 years as fully aquatic larvae before transforming into adults. 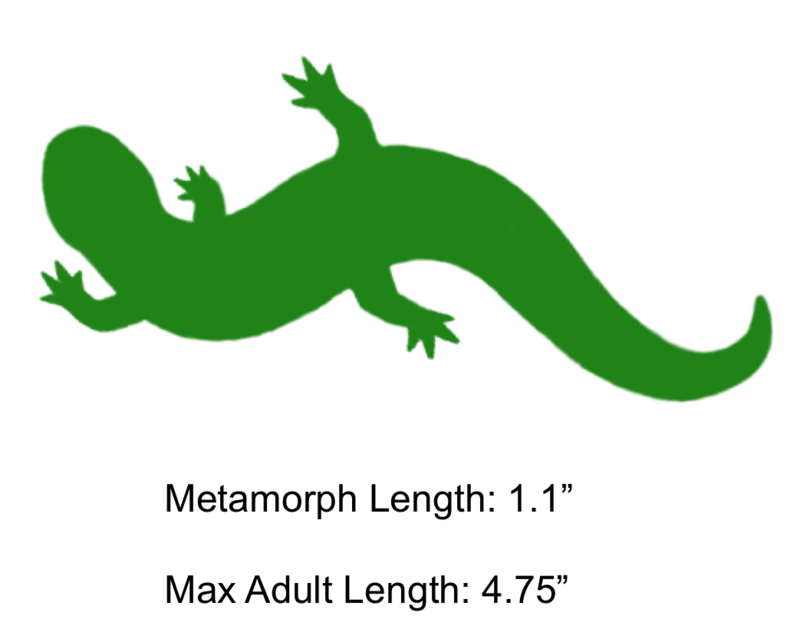 The shaded region represents the range of the Blue Ridge Two-Lined Salamander in North Carolina.